This article is about the 1-vs-3 minigame from Mario Party 2. For the level from Super Mario 3D World, see Rainbow Run (level). Rainbow Run is an unlockable 1-vs-3 minigame found in Mario Party 2. To get this minigame, the player must buy fifty minigames from Woody. 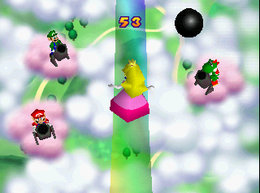 Although it has a different setting, this minigame is identical in concept to Tightrope Treachery from the first Mario Party. Unlike Tightrope Treachery, team players' clouds automatically move instead of having players control them. The solo player on the narrow rainbow must get to the goal line while three players on the clouds attempts to knock the rainbow runner off the rainbow. If the player gets to the goal, that player wins, but if the team of three knocks the rainbow runner down, the team wins. This minigame does not appear in the Mini-Game Coaster. Game Rules – "Keep your eyes on the goal as you run the rainbow bridge! Players in the clouds will try to knock you off with cannonballs! Advice – "The rainbow runner must maintain balance to cross the bridge without getting knocked off!" This page was last edited on November 8, 2017, at 18:25.